Hey there, Skill Miner is online. Today we are going to dive into an amazing learning opportunity from MITx. If you are an Engineer and always wanted to know more about material mechanics, there is a great way to do it. MITx offers a series of three courses on edx.org in this field. They will teach you both quick evaluation and deeper stress analyses of isotropic and anisotropic materials. Whether you are working in industry or planning to join it soon – this course will be useful. 2017, Budapest. We are sitting in a small office with my new colleague. The topic of a discussion is composite repair and I am explaining how it works. If you calculate proper patch parameters of a reinforcement, the repaired part can perform as good as the original one. The question came: “But why? Fibers aren’t continuous anymore, are they? How can it perform at the same level?” I wish I could explain it better that time. For example about the fiber critical length and other related topics of the mechanical side. It was again the moment when I felt that my engineering education is lacking some knowledge in polymers. Although wide practical experience compensates it. 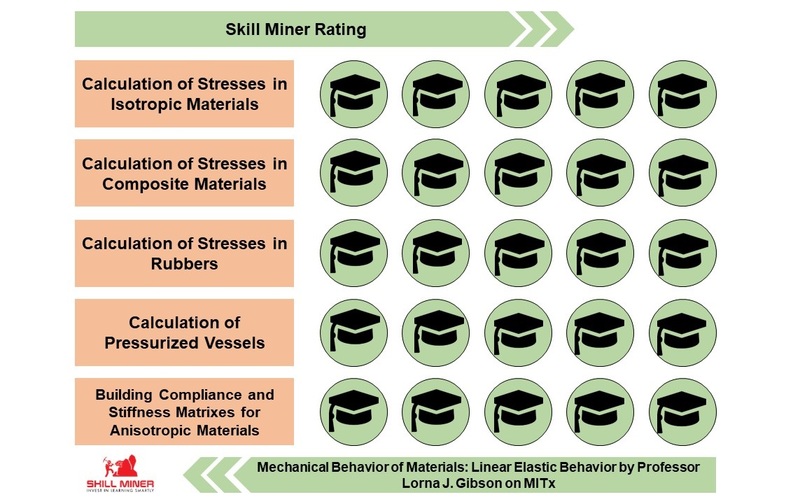 This was how I came across a series of wonderful courses created by Professor Lorna J. Gibson and her team from MIT. The beauty of this series is that you can take it with almost no knowledge of the topic. If you have good skills and theoretical background in math of course. The real MIT lectures in Mechanical Behavior of Materials are the core of this course. Such approach has its pros and cons. For example, sometimes there will be questions popping up from students. I see it as an advantage. Because they may coincide with the ones you have. Probably, the main disadvantage is that you have to wait until the Professor finishes writing on the blackboard. But even this you can solve by accelerating the video. The course has recitations. In a presentation format, they explain in detail all the possible practical tasks. This process is usually reinforced by practical exercises. Although, what I also liked, that there were the tasks that required some savvy. Tasks where you have to apply logic and knowledge from other engineering fields. Don’t be scared. Even if you can’t solve them you are still able to pass the course with an acceptable grade. A good list of reference materials and literature is available. A responsive engaging team turns this course in a nice learning experience. Even there was one questionable point for me. You have 20 attempts in a graded assignment to solve the task correctly (if it is not a multiple-choice task of course). So, learning on Internet has its specifics. You can’t easily approach your mentor as on a campus. Hence having several theories about the possible solution you can also learn by trying them out. And believe me, this is not a guesswork. You would never guess the answer if you have no idea in which area the solution lays. Important notice – you are not going to study how to work with software. All the tasks and calculations you do manually or with a minor help of spreadsheets. The course really pumps your solving skills in material mechanics. What is great for me, it equipped me with a set of formulas and concepts, which I use almost daily in my work. It’s a great reinforcement for experience motivated decisions. Make a rough estimation before your company spends thousands of dollars for FEM simulations. Professor Gibson always gives practical tips during the classes. She brings different specimens to the lectures and shows how the concepts work in the reality. It is important to reveal what the formulas hide behind. What is the real behavior which is described by the equations? For example, if we compare different Young Moduli. Which we must consider being huge and which not? This is a very applicable knowledge. When you have no time for search and have to make a fast evaluation you can give a quick expert evaluation. What I also loved is a connection to natural phenomena. Nature itself is a genius inventor. If I consider how everything works in our world, it leads me to a conclusion: “Everything has been already invented under the Sun. We only need to discover it and enhance with technologies”. A chapter was dedicated to the material mechanics in cellular solids. Quite unexpectedly there was a lecture called Built to Peck. It is about how woodpecker’s skull structure is designed. Really, have you ever thought how can this bird smash its had so fiercely against a tree trunk without damaging its brain? The lecture called Built to Peck gives an exhaustive explanation on this topic. It is remarkable that these concepts found a wide application in helmets design and other solutions, where impact energy absorption is crucial. This time there are 3 courses, therefore 3 evaluation tables for skills in material mechanics. One for each course in the series. 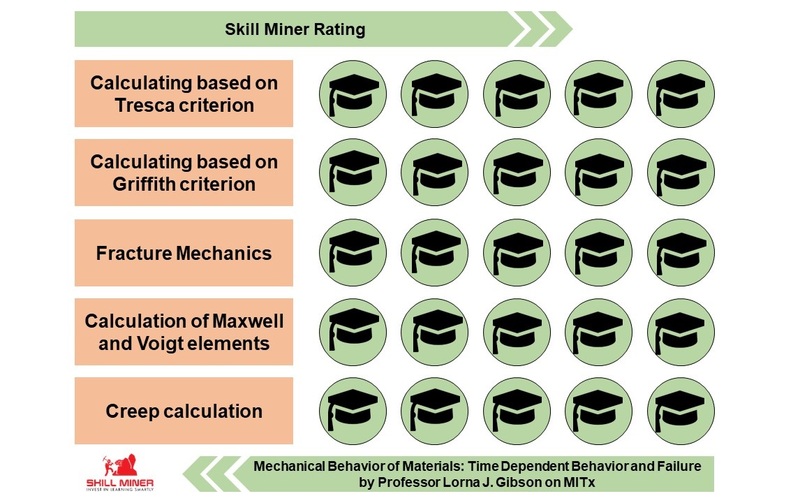 You can read about how I evaluate the skills here. So based on the promises and generated expectations I give all the skills maximum 5 out of 5 points. Please, consider that it doesn’t mean that you will become an expert on the topic after finishing them. I would formulate it like this – you will pay for a really high-quality content, and every dollar you invest worths it. Professor Gibson has fulfilled all promises from the course description. For this course, you would require as I mentioned above good mathematical skills in linear algebra and calculus. Some of the mathematical concepts are not explained in the course and are given as ready to use knowledge. Altogether you should pay 150.00$ for 3 courses if you want to obtain a certificate in the end. Each course is 50.00$. The estimated time to finish is 60-70 hours for three courses. Posted on June 6, 2018 by Posted in Courses, edx, EngineeringTagged Fracture Mechanics, Material Mechanics, mitx, Udemy.